I was nominated a long, long, long time ago by Merlin over at Merlins Musings. This post (and the next couple) are long overdue but finally I am doing this. I love quotes so it is a very nice challenge. I AM ALWAYS ALONE. BUT JUST NOW I WANT TO BE ALONE BY MYSELF. Reaper Man by Terry Pratchett is one of my favorite books about The Discworld. DEATH is my favorite character of all the books. He is wise and emo. Pretty much. To always be alone doesn’t necessary mean that you are physically alone. I always say that I am alone even in a crowd of people. It’s accurate most of the time. I haven’t chosen to be alone, it just happens to be that way. I don’t feel like I belong anywhere and that makes one feel lonely. You can feel lonely even when you are with someone. I do sometimes even though I have a family who loves me unconditionally. Still, some days I feel lonely because they have something I don’t have being mentally ill and non-working; friends, co workers and activities. No, I don’t feel sorry for myself, in a way I have chosen the life I live now. I am hindered by my anxiety but it is no reason to isolate myself of course. I do it anyway because it is damn hard to walk out through the door when I am in a depression. It’s easier to stay at home, being a coward. Back to DEATH though; I am alone and I am lonely [sometimes] but I haven’t always chosen to be. Other times I am alone on my on volition. I need to be alone to function. It might seem strange maybe wanting to be alone when I am alone as much as I am already. Still, the need for loneliness is strong. It’s needed. Even DEATH knows that, and live by it, and maybe that’s why I love him so much; I can relate. Next ›Step Right Up, Folks! Don’t Be Shy. Be Prepared To Witness The Whimsical, The Outlandish, And The First Ever WordPress Anime Awards! 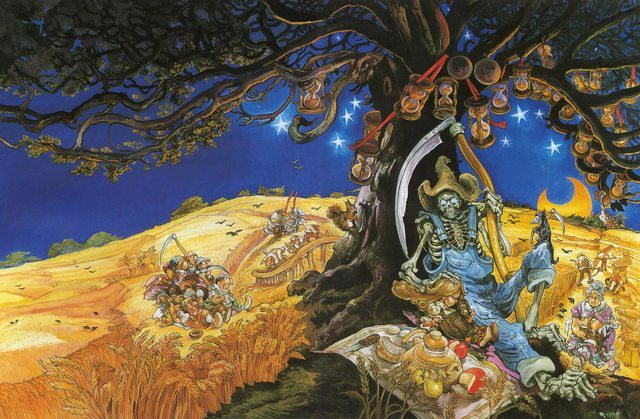 I love the Discworld version of Death. He’s an incarnation of one of the primary governing forces of the universe, and still he’s so… human, I guess. Yes! He is probably my favorite death. I mean, dude’s even got a daughter. How cool isn’t that. When I was a kid, Death was a friend of mind. She was a 12 year old freckle-faced redhead with a black cowled robe and scythe. I talked to her a lot. The best place in the world to be alone is deep in the wild. Nature is totally oblivious to you and you get to feel unimportant for a while. Television or radio to distract. No computer to blog on. Leave the MP3 player at home. You can scream but nobody will hear you. No 911 so you are finally fully responsible for your own fate. You can be your own true self without fear of embarrassment or rejection. No audience that requires you to entertain them or to be politically correct. JUST BE CAREFUL WITH FIRE. And I get to be “au naturel” without worrying about close encounters of the hostile kind. The *real* fun begins when I have forgotten I am naked. Now I’m one with her. That sense of pure existence (for me at least) does not come from a blog post or watching an anime or earning a paycheck.